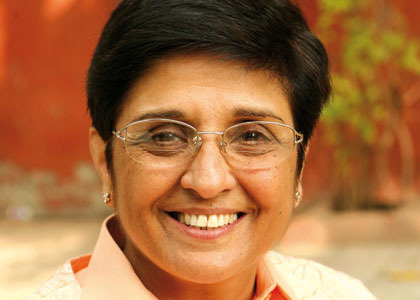 Kiran Bedi was India’s first and highest ranking – she retired in 2007 – woman police officer who joined the Indian Police Service in 1972. Her experience and expertise include more than 35 years of tough, innovative and welfare policing. She has been voted as India’s most admired woman, most trusted woman and fifth amongst all Indians. Kiran went to the Sacred Heart Convent School, Amritsar, and it was here that she joined the National Cadet Corps (NCC). Later, she obtained her BA in English from the Government College for Women, Amritsar. She then earned a Master’s degree in Political Science from Punjab University, Chandigarh, topping the University. Whilst in active service in the Indian Police, Kiran continued her educational pursuits, and obtained a law degree (LLB) in 1988 from Delhi University. In 1993, she did her Ph.D. in social sciences at the Indian Institute of Technology, Delhi, where the topic of her thesis was ‘Drug Abuse and Domestic Violence’. Kiran began her career as a lecturer in political science at Khalsa College for Women, Amritsar. In 1972, she joined the Indian Police Service and under took a number of tough assignments ranging from Traffic Commissioner of New Delhi, Deputy Inspector General of Police in insurgency prone Mizoram, Advisor to the Lieutenant Governor of Chandigarh, Director General of Narcotics Control Bureau and Civilian Police Advisor to the UN Peacekeeping department, for which she was awarded with the UN medal. She is popularly referred to as Crane Bedi for towing former Prime Minister Indira Gandhi’s car for a parking violation. Kiran influenced several decisions of the Indian Police Service, particularly in the areas of control over narcotics, traffic management, and VIP security. During her stint as the Inspector General of Prisons, Tihar Jail, Delhi (1993-1995), she instituted a number of reforms in the management of the prison, and initiated several measures such as detoxification programs, yoga, re-dressing of complaints by prisoners and literacy programs. She was last appointed as Director General of India’s Bureau of Police Research and Development. In November 2007, she expressed her wish to take voluntary retirement to take up new challenges in life. Kiran’s other interests include tennis at which she won the Asian Lawn Tennis Championship in 1972, and the All-India Interstate Women’s Lawn Tennis Championship in 1976. A dedicated social activist, she founded two NGOs in India: Navjyoti for welfare and preventive policing in 1987 and India Vision Foundation for prison reforms, drug abuse prevention, and child welfare in 1994. She is the author of many books, including, ‘It’s Always Possible: One Women’s Transformation of India’s Prison System’ and ‘I Dare! : Freedom from Sabotage & The Gandhian Way: If I Were The Police Commissioner’, has been a columnist for Times of India, National Daily and Tribune, and has also anchored radio and television shows. She has received many awards including the President’s Gallantry Award (1979); Women of the Year Award (1980); Asia Region Award for Drug Prevention and Control (1991); Ramon Magsaysay Award (1994) for Government Service; Mahila Shiromani Award (1995); Father Machismo Humanitarian Award (1995); Lion of the Year (1995); Joseph Beuys Award (1997); Pride of India (1999); Mother Teresa Memorial National Award for Social Justice (2005); Amity Woman Achiever for Social Injustice (2007); Public Service Excellence Award (2007), Zee Astitva Award (2007), The Indian Society of Criminology (2008); Pride of Punjab (2008), Women Excellences Awards (2009) (Aaaj Tak); Nomura Award (2013) for humanitarian works.